We travel back in time on board an historic tram from the 1920s, from which we can admire the city's buildings and most important monuments and then pay homage to a world renowned footballing megastar with a visit to the Pelé Museum. 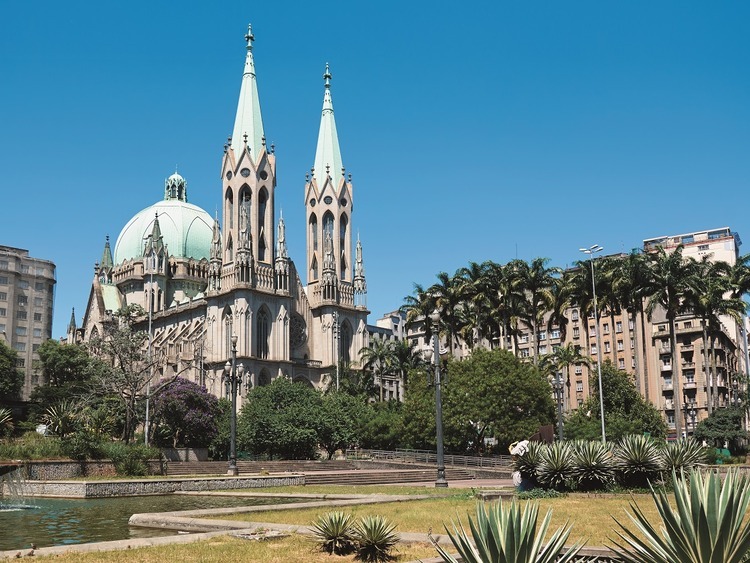 We arrive at Praça Mauá, the heart of the old city, with its large pedestrian area used as gardens with geometric mosaics, fountains and luxuriant trees. Here, we climb aboard an historic tram, built in the 1920s and completely restored, one of the few relics of its era. The tram covers 1,700 metres in about 15 minutes, travelling down the main streets of the city centre, and in so doing becoming a a real time machine: historic buildings and monuments that tell of previous centuries pass before our eyes. From the tram windows we see such architectural gems as the Conjunto do Carmo convent, one of the oldest examples of Brazilian baroque, the beautiful Casa da Frontaria Azulejada b>, designed in the neoclassical style and covered with blue and yellow tiles from Portugal, and the Mausoleum of Brás Cubas**, founder of the city of Santos. Alighting the tram, we take a pleasant stroll to the Pelé Museum the city's newest attraction, which is next to the restored railway station built in 1867, in the historic area of ​​the quay. Housed in a historic 19th century building, the Pelé Museum is a celebration of the great Brazilian footballer housing many mementoes of his career, including shirts, football boots, balls, medals and trophies for a total of 2,354 pieces that are exhibited in rotation according to the chosen theme. In the 4,134 square metres of the museum, we can also see films, images and writings on the star. There is also an interactive space to test our ball skills and match ourselves against the talents of Pelé. After the visit, we say goodbye to the city of Santos, and return to the port. The visit to the Pelé Museum lasts about 140 minutes. Palaces, churches and monuments may be closed without notice. In this case, the visit will be external only.